Drain and rinse the cashews. Add them to a blender and blend until smooth. You may need to add a little water to get the consistency right. Add everything into a jar and mix well. I like these jars . Place the jar in the fridge overnight and enjoy the next morning! What kind of coconut milk? Canned or carton in refrigerator section? Also, can you buy vanilla powder in grocery stores. ..TJ, WF, or those? TIA. Looking forward to making these oats for first time!! 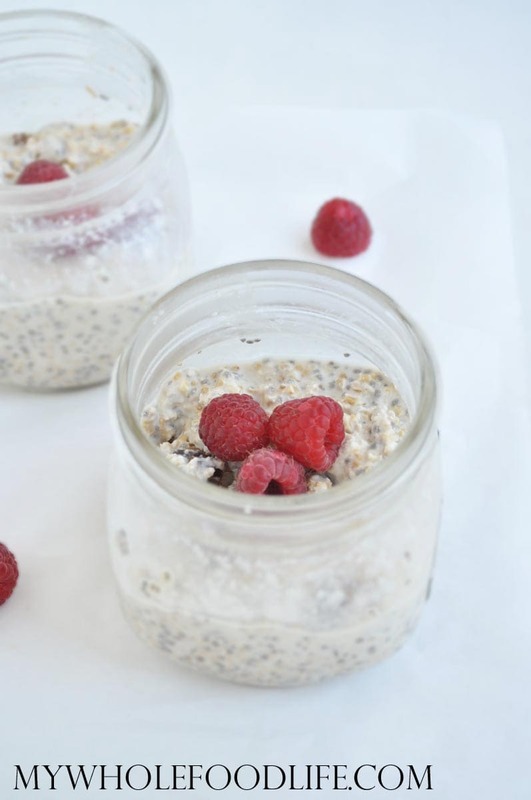 I love raspberries and I love oats- so this is perfect! Thankyou!!! Hi Melissa, these are amazing recipes, Thank you so much for sharing these with us!! I was wondering, do you have the nutritional values for the recipes? I am on a controlled calorie eating plan and was wondering how you would go about figuring out the calories, protein, carbs, etc. Hi Michele! I am sorry I don't know them, but I have been told that my recipe format is compatible with My Fitness Pal. So you should be able to check it out through them.